Leaving my girls, which is SO very rare. I am going to California & meeting, in person, my blog besties. caring and kind that I thought existed in today's world. I am so excited to do something so out of the ordinary. But more importantly, help with something so WONDERFUL. To collect 100 handmade and heartfelt items. Divide them into 10 giant, happy prize bundles. Have five days of giveaways. Two bundles of prizes featured each day. But not just the "enter, enter, enter, get, get, get" type of giveaways. Each $10 donation to charity:water equals one entry. Readers can choose their favorite prize bundle or bundles, donate and then put their names in the drawing to win. We will have our own webpage so entrants can donate directly to the well and we all can track and celebrate the progress. If you have an Etsy shop great! What wonderful advertising. Your shop will be linked and featured in each post that includes one of your prize donations. If you don't have an Etsy shop, but thought about opening one? What a great excuse! But let's just say you would just love to use your hands to create something? You are so welcome to! Even if you don't have aren't able to donate anything handmade, don't feel like you can't help. Let's say someone donates a cozy coffee cuff? What if you donated a Starbucks card to compliment it? Or someone donates a necklace? How about a Target card that the winner could go buy a new top to match it? What does Julie's Project 320 stand for? Julie has a blog ready to go to host the giveaways and showcase all of you dear participants. Please follow this blog as she is about to post some wonderful things! So in two weeks, when I am in Cali visiting my new friends, we will combine all of the wonderful donations and divide them into packages and prepare the blog posts together. with the winners announced on the 21st. All prize donations will need to be at Julie's house by December 10th. I know that doesn't give you a ton of time and life is crazy hectic right now. If you live by me I can take any donations with me to California. Just make sure I have your items by Thursday December 10th! Be sure to send business cards and/or your blog addy with the package so we can properly link you and thank you. Contact me for Julie's address if you would like to send your donations! I'm not the jealous type...so, I'll just say that you are one lucky gal! You girls have fun now, ya hear?! And, keep an eye out for my gift for the project. i can't wait to help!! Can't wait to see your pretty face in person!!! HOLLA! i found your blog from the project 320 link this morning (i had to click on your link, as i'm from the midwest too). god is working through you in an awesome way. your girls are beauties! i have a sweet gracie girl too. have you ever heard the ben folds song "gracie"? having a gracie girl, you gotta love it! What a great crusade. Love every part of it. Enjoy our sunny state. 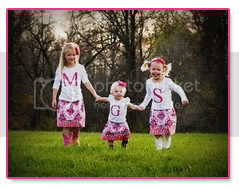 Your blog is adorable and your girls.. .holy cow! Precious!